Obscured by thick clouds of absorbing dust, the closest supermassive black hole to the Earth lies 26 000 light years away at the centre of the Milky Way. This gravity monster, which has a mass four million times that of the Sun, is surrounded by a small group of stars orbiting at high speed. This extreme environment – the strongest gravitational field in our galaxy – makes it the perfect place to test gravitational physics, particularly Einstein's general theory of relativity. New infrared observations from the exquisitely sensitive GRAVITY, NACO and SINFONI instruments on ESO's Very Large Telescope (VLT) have now allowed astronomers to follow one of these stars, called S2, as it passed very close to the black hole during May 2018 at a speed in excess of 25 million kilometres per hour – three percent of the speed of light – and at a distance of less than 20 billion kilometres. The new measurements clearly reveal an effect called gravitational redshift. Light from the star is stretched to longer wavelengths by the very strong gravitational field of the black hole. And the stretch in wavelength of light from S2 agrees precisely with that predicted by Einstein's theory of general relativity. 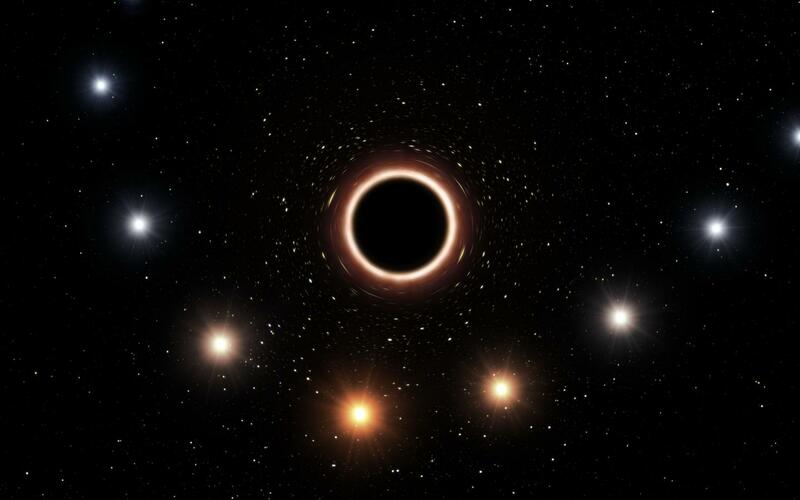 This is the first time that this deviation from the predictions of simpler Newtonian gravity has been observed in the motion of a star around a supermassive black hole. The team used SINFONI to measure the motion of S2 towards and away from Earth and the GRAVITY interferometric instrument to make extraordinarily precise measurements of the position of S2 in order to define the shape of its orbit. GRAVITY creates such sharp images that it can reveal the motion of the star from night to night as it passes close to the black hole – 26 000 light years from Earth. 'Our first observations of S2, about two years ago, already showed that we would have the ideal black hole laboratory', adds Frank Eisenhauer (MPE), Co-Principal Investigator of the GRAVITY instrument. 'During the close passage, we managed not only to precisely follow the star on its orbit, we could even detect the faint glow around the black hole on most of the images.' By combining the position and velocity measurements from SINFONI and GRAVITY, as well as previous observations using other instruments, the team could compare them to the predictions of Newtonian gravity, general relativity and other theories of gravity. As expected, the new results are inconsistent with Newtonian predictions and in excellent agreement with the predictions of general relativity. More than one hundred years after he published his paper setting out the equations of general relativity, Einstein has been proved right once more. The hardware contribution of the Institute of Physics I of the University of Cologne was the development and construction of the two spectrometers of GRAVITY. The spectrometers analyse the wavelength of the observed stellar light and convert the received photons into electronic signals. 'GRAVITY is a technological challenge. However, after more than two decades of astrophysical research on the high velocity stars in the Galactic Centre and on the development of astronomical instrumentation, the effort has been rewarded with an excellent result in experimental physics', says Andreas Eckhart from the University of Cologne. Continuing observations are expected to reveal another relativistic effect later in the year – a small rotation of the star's orbit, known as Schwarzschild precession – as S2 moves away from the black hole. Spacetime -- a creation of well-known actors?